Eltronicschool. - This is regulated power supply circuit schematic with adjustable that can produce 0-28V / 6-8A. 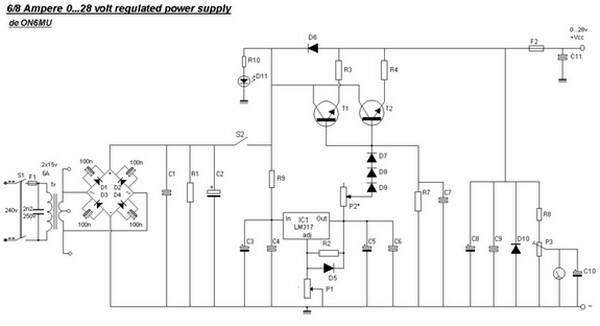 This circuit schematic Adjustable Regulated Power Supply 0-28V / 6-8A using LM317 and 2N3055 like in Figure 1 below. D1...D4 = four MR750 (MR7510) diodes (MR750 = 6 Ampere diode) or 2 x 4 1N5401 (1N5408) diodes. Circuit schematic like in Figure 1 above is Circuit Schematic Adjustable Regulated Power Supply 0-28V / 6-8A using LM317 and 2N3055. According Electronics-diy site describe that his is an easy to make power supply which has stable, clean and regulator 0-28V 6/8 Amp output voltage. By using two 2N3055 transistors we become more then 2 times the amount of amps then the power supply delivers, making it real though to brake ;). Although you could use this design to deliver 20 amps (with almost no modifications and with a proper transformer and a huge heat sink with a fan), I did not needed such much power. Make sure you mount them on a huge heat sink, as the 2N3055 transistors can get very hot at full load. Although the LM-317 power regulator will kick in on shortcircuit, overload and thermal overheating, the fuses in the primary section of the transformer and the fuse F2 at the output will secure your power supply. The rectified voltage of: 30 volt x SQR2 = 30 x 1.41 = 42.30 volt measured on C1. So all capacitors should be rated at 50 volts. Caution: 42 volt is the voltage that could be on the output if one of the transistors should blow. P1 allows you to 'regulate' the output voltage to anything between 0 and 28 volts. The LM317 lowest voltage is 1.2 volt. To have a zero voltage on the output I've put 3 diodes D7,D8 and D9 on the output of the LM317 to the base of the 2N3055 transistors. The LM317 maximum output voltage is 30 volts, but using the diodes D7,D8 & D9 the output voltage is approx 30v - (3x 0.6v) = 28.2volt. Read more here.